With all the talk of the Hall of Fame induction today for Scott Stevens for his three Stanley Cups with New Jersey combined with Al MacInnis, Ron Francis and Mark Messier being inducted combined with Butch Goring mentioning he was going to Toronto to play the legends game on Hall of Fame weekend the question has to be asked how can Butch Goring, who never goes a trade deadline without being mentioned as the all time standard for trades that bring championships combined with his career numbers not be in the Hockey Hall of Fame at this point? This was a player who was a star forward with Los Angeles, his 1,107 NHL games netted him 375 goals and 888 points. Despite his aggressive play, Goring recorded only 102 penalty minutes in his NHL career. 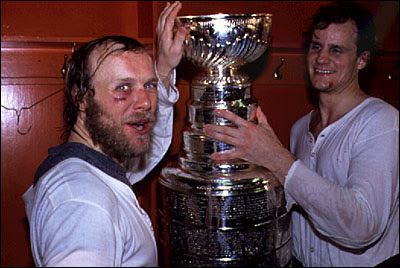 With the Los Angeles Kings in 1978, he became the only player ever to win the Lady Byng and Masterton Trophies in the same year. 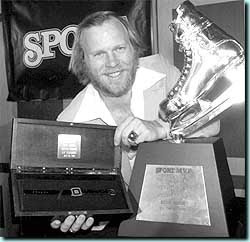 Butch Goring came here and was not only a key part of four straight Stanley Cups which has not been matched in pro sports to this day but won the Conn Smyth for the 1981 playoffs. Every Islander who talks about those teams credits Goring as critical to their success. Goring scored 28 goals and 68 points in 99 playoff games with the Islanders, totals that include five playoff game-winners. Meanwhile his banner does not even hang in the Coliseum rafters when even Pat Lafontaine had a ceremony and Bob Bourne was inducted into the club's new Hall of Fame last year? This does not enter into any Hall of Fame discussion, however no Islander team worked harder with less talent than the team Butch Goring coached in his first season with the club. His dismissal was a joke considering Mike Milbury altered his club's first year chemistry. won a championship as a coach in Germany. He was a part of several Coliseum charity games in recent years and was at the clubs 25Th Stanley Cup anniversary. Today he's still a great ambassador to the NHL and his insight into Islander telecasts finally had made that segment of the telecast of value to the broadcast for maybe the first time ever. Meanwhile Butch Goring is as classy as ever, going up to Toronto to participate in the legends game during induction weekend. 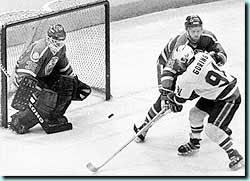 Time for the selection committee to get together and make Robert “Butch” Goring a Hockey Hall of Famer, it's long overdue.